AMSTERDAM, NY – Plumbing contractors install various products over the course of their careers and doubtless hold equally various opinions on them. When they install one in their own homes, however, it’s a statement that something about that product must be particularly advantageous, based on their experience. It’s the type of statement that Don Frederick Sr. recently made when he installed an above-floor macerator in his home’s basement. Frederick has owned and operated Advanced Mechanical, a plumbing, heating and air-conditioning business in Amsterdam, NY for the past 21 years. Together with his son, he works to address his customers’ various plumbing and HVAC needs across the east-central portion of the state. Recently, Frederick had a very special customer—himself. 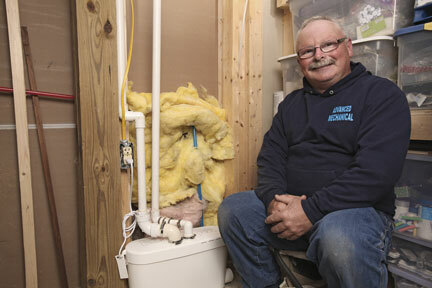 He wanted to add plumbing to his three-story, log cabin home’s walk-in basement, from which he runs his business. “In addition to a guest bedroom, we keep our business office down there and felt we needed to add some sort of bathroom,” says Frederick. He and his wife decided to convert an existing closet into a half bathroom. 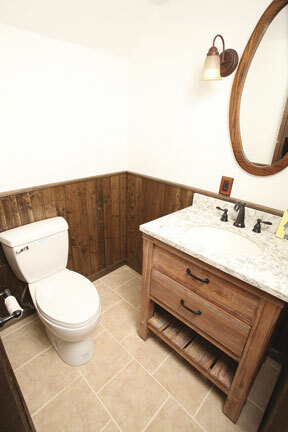 “Since we put the half bath in what used to be a closet, my wife now calls it our water closet,” mentions Frederick. He had just one problem—the walk-in basement was below the home’s drain line, making it impossible to install a conventional bathroom. 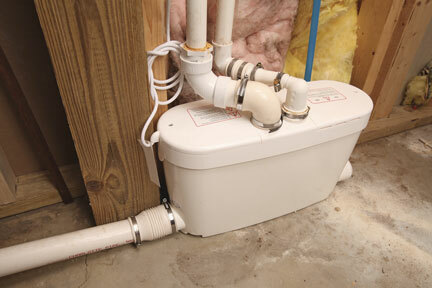 His first instinct was to take the conventional route of installing a sewage ejection pump. However, he recalled various problems he had run into while using this method in the past. For a more affordable and less labor-intensive solution, Frederick consulted his longtime distributor: Tom Nachbar, branch manager of Security Plumbing and Heating Supply in Schenectady, NY. In business since the 1930s, Security is a wholesale distributor of plumbing, heating, and air conditioning products, with 12 locations serving the lower Mid-Hudson Valley north through the Adirondack Region of New York, and into Western Massachusetts. “When Don told me about his basement project, I knew immediately that Saniflo above-floor plumbing was the solution,” says Nachbar. Frederick himself admits that he always considered above-floor plumbing as a viable solution to his problem. “I was introduced to Saniflo through Security more than 10 years ago and have installed it in various applications without issue,” recalls Frederick. Designed for both commercial and residential applications, above-floor plumbing systems macerate (or grind) waste into a slurry before pumping it horizontally or vertically to a home’s or building’s drain line. 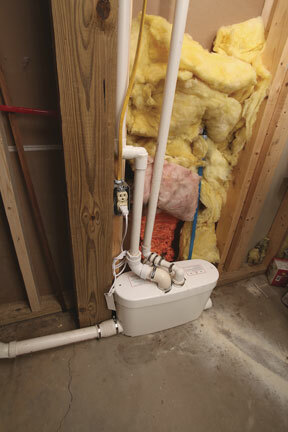 The technology is significantly less expensive and less difficult to install than a traditional sewage ejection pump and is becoming increasingly accepted not only for basement applications, but also for any part of the home where conventional plumbing is not a viable option. The only decision left for Frederick was which above-floor plumbing product to choose. Nachbar recommended the Saniaccess3 macerator, which comes equipped with two easy-to-open panels atop the unit, providing ready access to the internal components for servicing. 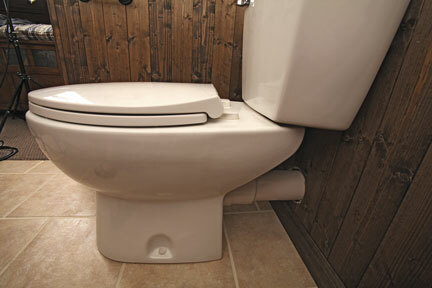 Periodic maintenance can be accomplished quickly and easily without having to disconnect the unit from either the toilet or the rest of the plumbing system. The pump can discharge waste up to 15 vertical feet and 150 horizontal feet. Frederick took on the bathroom project himself in January 2016, completing the above-floor plumbing installation in less than a day. 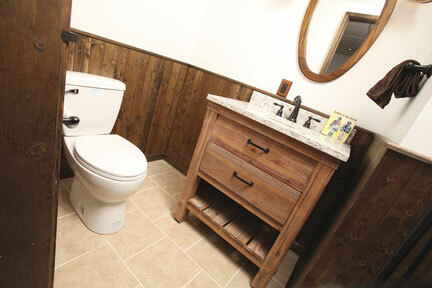 The macerator handles waste from two fixtures in Frederick’s half-bath application—a toilet and a sink. Two installation options are available for the macerator: (a) In front of the wall or (b) behind the wall with an extension pipe. Frederick decided to do the latter. “Aesthetically, I thought behind-the-wall looked better,” he explains. Frederick’s experience with his installation mirrors that of all the Saniflo installations he has done over the past 10 years. “These products always work out great for me. I wouldn’t have installed one in my own home if I didn’t have that trust,” he explains. 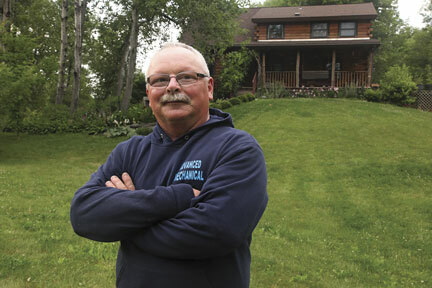 Plumbing contractor Don Frederick Sr. recently made the decision to install an above-floor plumbing system from Saniflo in his log cabin’s basement. 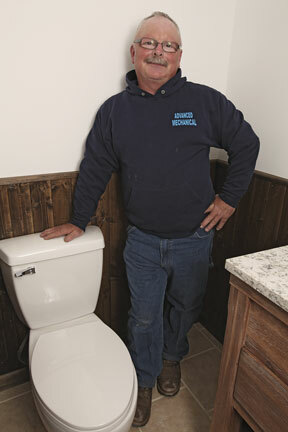 Plumbing contractor Don Frederick Sr. stands next to his log cabin basement’s toilet, which uses a Saniaccess3 macerator from Saniflo. Plumbing Contractor Don Frederick Sr. installed the Saniaccess3 macerator from Saniflo behind the wall in his new bathroom. The Saniaccess3 macerator from Saniflo comes equipped with two easy-to-open panels atop the unit, providing ready access to the internal components for servicing. The Saniaccess3 macerator from Saniflo can discharge waste up to 15 vertical feet and 150 horizontal feet. 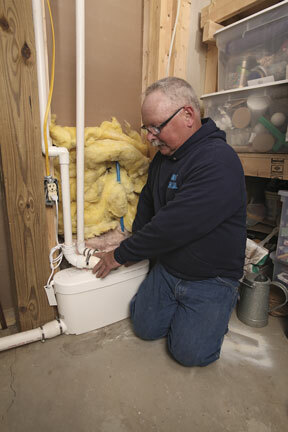 Plumbing contractor Don Frederick Sr. adjusts his Saniaccess3 macerator from Saniflo. Plumbing contractor Don Frederick Sr. behind the wall of his new basement bathroom with a Saniaccess3 macerator from Saniflo. 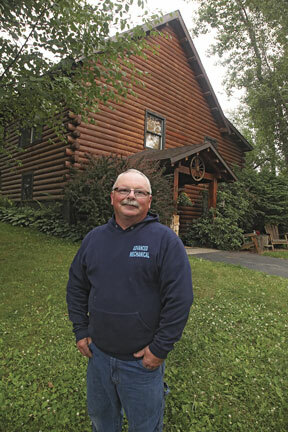 Plumbing contractor Don Frederick Sr. stands in front of his Amsterdam, NY, log cabin home. 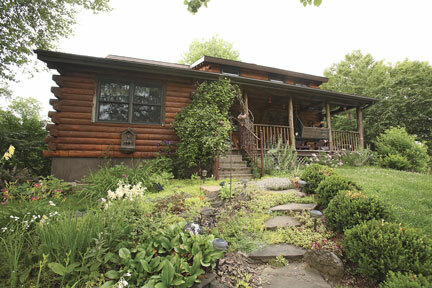 Plumbing contractor Don Frederick Sr.’s log cabin home in Amsterdam, NY.